DownWithTyranny! : The Trumpanzee Is Worse Than Hillary! Catchy Election Slogan? The Trumpanzee Is Worse Than Hillary! Catchy Election Slogan? How lucky is Hillary Clinton that the inept, bumbling, stumbling Trump campaign is no match for her incredibly well-honed and utterly ruthless Machine. Team Trumpanzee has allowed Clinton to turn the 2016 campaign into a referendum on him. They've tried and tried to turn it into a referendum on her, of course, but in a classic lesser-of-two-evils election like this, a candidate unable and disinclined to control his dysfunctional and narcissistic impulses will never stand up to what Hillary can unleash without even breaking a sweat. She is simply crushing him-- and, because it's him even people who distrust and dislike her are cheering. The latest Monmouth poll, released yesterday, shows a tragically divided country. When asked if the election of Trump is a threat to their own way of life, 54% of registered voters said yes. 42% said Hillary's election would be a threat to their way of life. Once again, she's the lesser evil. Also yesterday a Marquette Law School poll of supposedly swing state Wisconsin likely voters, showed Hillary with a stunning 15 point lead over the flailing Trumpanzee-- 52-37%. (Down-ballot, that's killing Republican Senator Ron Johnson, who's losing to Russ Feingold among likely voters, 53-42%. Republicans are correct to worry that this could be replicated everywhere outside of the old slave-holding states. Writing for Trump's son-in-law's paper, The Observer, Michael Sainato made a strong case this week that the only thing Clinton offers progressives is fear of Señor Trumpanzee. 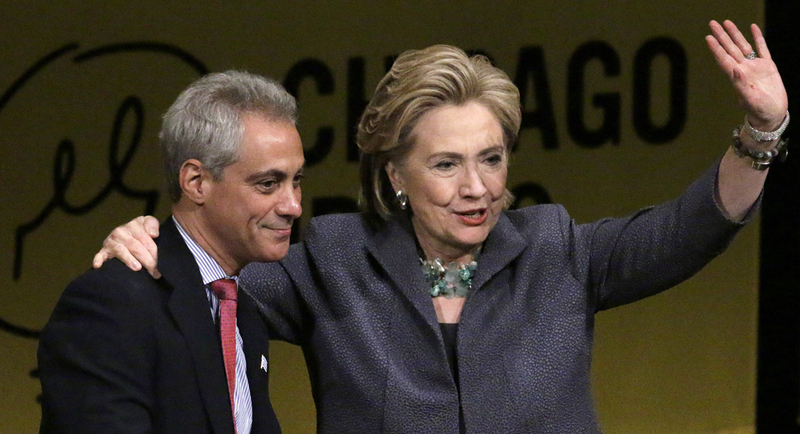 His thesis is that she's "transformed the Democratic Party into a corporate oligarchy." He gives her a lot of credit for a project her whole wing of the party has been working on for many years. What she does deserve a lot of "credit" for, though, is turning progressives off to the Democratic Party. Progressives, just like other pieces of the FDR coalition, are falling away from a changing party-- and not changing in a good way. Now that Hillary Clinton has wrapped up the Democratic presidential nomination with the endorsement of Bernie Sanders, her supporters have transitioned to denigrating progressives who affirm they are “Bernie or Bust” by supporting Green Party presidential candidate Jill Stein over Clinton. Regardless of his endorsement of former Secretary of State Clinton, Sen. Sanders has affirmed the importance of continuing the political revolution, and many of his supporters are choosing to do that outside of the Democratic Party. ...The term “spoiler” is now being applied to Stein by Democrats, in order to emotionally blackmail any Sanders supporters entertaining supporting her over Clinton. What these criticisms conveniently omit is Libertarian candidate Gary Johnson is polling on average around 7 points, with Stein averaging around 2.8 points, yet polling averages that include only Trump, Clinton, and Johnson are averaging with Trump winning at 0.2 points, and averaging at a tie with four-way polls that include Stein. If a third party candidate is truly a spoiler, polls should be indicating a greater inverse correlation benefiting Clinton when Johnson is included-- but they don’t. Instead of scapegoating Sanders supporters who refuse to fall in line behind Clinton as the reason for the current polls showing a close general election, the Democratic Party needs to enact reforms to alleviate the factors that make Clinton such an unappealing presidential candidate. The efforts of the Democratic National Committee (DNC) and the Clinton campaign to discredit Sanders have disenfranchised a number of voters from the left who view it as a party overrun by corporate and wealthy influences. Now the same Clinton supporters and establishment journalists who ran smear campaigns to portray Sanders supporters as all white, sexist males have transitioned to making Stein seem hysterical. They have accused her of being anti-vaccine and anti-Wi-Fi signals, though both of those slurs were debunked by the Stein campaign. The recent Wikileaks release and leaks from hacker Guccifer 2.0, provide some insight into how the Democratic Party establishment, through the DNC, undermined Sanders and democracy by tipping the scales in favor of Clinton. According to the New Republic, the Democratic National Convention this year was privately funded for the first time, and the convention’s host committee refuses to disclose the names of corporate donors in defiance of a court order. The Clintons have led the way in this transformation of the Democratic Party into a corporate oligarchy. The North American Free Trade Agreement (NAFTA), welfare reform, the 1994 crime bill, and deregulation of the financial industry under Bill Clinton’s administration hurt working and middle class Americans, while serving the interests of the country’s wealthiest and largest corporations. Instead of learning from her mistakes, Hillary Clinton appears eager to repeat them in her own presidency. Her selection of Sen. Tim Kaine as her V.P. was viewed as a slight toward progressives due to his stances in favor of the Trans-Pacific Partnership (TPP) and Wall Street in general. Clinton’s decision to hire Rep. Debbie Wasserman Schultz as soon as she resigned as DNC chair in the wake of the Wikileaks revelations of corruption demonstrated that Clinton is happier to preserve the status quo than reform it. Sanders’ campaign illuminated the numerous ways Democrats have let down their own progressive base over the past few decades. While his endorsement of Clinton is a result of his belief that his political revolution would be better served under her than Donald Trump, many voters already let down by President Obama and other Democrats will refuse to give Clinton and the Democratic Party the benefit of the doubt again. As Nelson Mandela said, “may your choices reflect your hopes, not your fears.” The only qualification Clinton offers many voters is the fear of Trump. Without the hope of a better future in either Hillary Clinton or Donald Trump, it should come as no surprise to the Democratic Party establishment, or their elite mainstream media counterparts, that voters are looking elsewhere in a presidential candidate, or have even completely lost interest in participating. President Obama was elected due to his ability to offer hope to voters. Clinton has not done that. Instead of attempting to do so by catering more to the progressive base of Sanders supporters, she has dismissed them and focused her campaign on using the fear of a Trump presidency to get elected. This tactic may allow her to win the presidency, but for the Democratic Party in the long term, it is a course which will likely result in further losses in congress and state legislatures across the country. 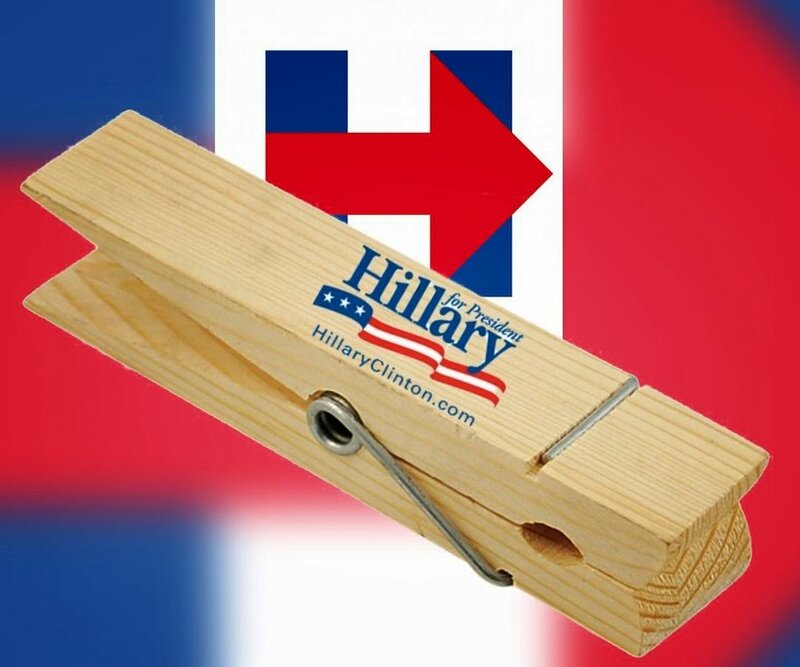 I will literally be wearing a clothespin while I vote for her. I am so bummed to be voting against someone again instead of "for" someone. Yes, this election is a very sad state of affairs. Trump is so horrible that we must actively support Hillary, whom many of us dislike. Her corporate connections and hawkishness are real negatives, but in light of the Trumpanzee, she looks good. Maybe she is a 4 out of 10, but he is minus 100. What a choice before us! BUT TRUMP MUST BE STOPPED IN HIS TRACKS. Clothespin sales should go way up - investing anyone? Or you could vote for Jill Stein. Gary Johnson has bled a ton of support from Trump. Stein would have a chance in a 4-way race if people had a conscience that could overcome their abject fear.